If you want to check who accepted or declined a meeting invite in Microsoft Outlook 2016, 2013 or 2010, here’s how. Select the “Calendar” icon in the “Navigation Pane“. Double-click the meeting you want to check. Under the “Meeting Occurence” tab, select the “Tracking” button. From there, you can select “View Tracking Status” to view the response for each person. Note: Only the meeting organizer can view this option. When I need to see if other colleagues accepted or not I cannot…!!! I’ve assumed for a very very long time that if I accept a meeting and don’t send a response that the meeting’s tracking tab would indicate to the organizer that I had accepted the meeting. I too didn’t want to flood organizer’s in boxes with acceptance emails. Today I was investigating the approach of sending a meeting and not requiring a response, and my teammates told me the accepted but the tracking screen for the meeting shows “none”. This seems messed up. Thanks for details. its very helpful!!!! Is there a way to track who accepts /declines a meeting with the Response Option not checked? I need to track who has accepted/declined ; however, I don’t want a flood of emails to my inbox. I was hoping to be able to see the calendar and have the meetings that were accepted show a different color or some other flag without having to go into another component. shows who accepted/declined – not the date. Outlook 2013. 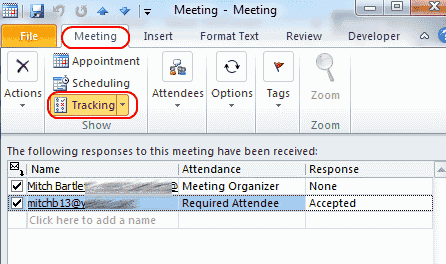 In Outlook “View” tab, Choose “People Pane” and choose Minimized or Normal to display the list of attendees. This option will also show all participants response in a Glance! You have to add the Tracking component to your Ribbon. Go into File/Options/Customize Ribbon. 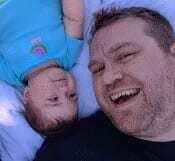 I found the group of tracking commands by playing around with the drop down menu. Then you add them to the Ribbon. Okay, this has bothered me for a while. The solution is, from the email section look at the view tab, find people pane and click normal. This will bring the people pane up for emails and calandar. Same steps except use the “scheduling assistant”. Is there a way to track the date a meeting attendee responded? I understand that we get a Tally count under the appointment tab and that can check to see you accepted the invitation via their response on the tracking tab. However, I am not sure how to tract if someone accepted the invitation, declined, or marked tentative if they did not send a response. Does the tracking feature include those who did not send a response or only those who did? I ahve the same porblem with OUtlook 2016 on Mac. The tracking tab is not there. Any solutions? I have Outlook 2016 MSO 16.0.6925.1016. No tracking tab. I received an email with acceptance of the meeting, but when I check the attendees in the Tracker, it says “none” (meaning no acceptance of the invite received). So, the calendar is not updating the acceptance response. Please help. Thank you! Thanks. Any tips for Outlook 2016 on Mac? The tracking tab is not there.